I’m a chronic list writer. 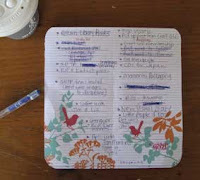 Every morning I start my day by writing a list. Unfinished things from the previous day get moved to the new list each morning. I’m one of those people. There is nothing more satisfying to me than scrawling big lines through items on my list (hanging out with me is always a lot of fun), and today is one of those special days when I get to scrawl a few of those nice big lines. Public art install finally finished yesterday (I sank into a relief and exhaustion induced coma about 4pm yesterday afternoon, not to stir until 7am this morning), a big box of work sent off to a beautiful shop in the USA called FINCH, and some (very late) orders and commissions posted off. Im a list lover & maker too. And I love hanging clothes on the line.